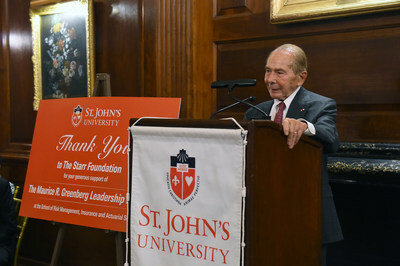 QUEENS, N.Y., Sept. 13, 2018 /PRNewswire/ -- Conrado "Bobby" Gempesaw, Ph.D., President of St. John's University, today announced that the largest single gift in the 148-year-old history of the University has been received from The Starr Foundation. With the historic $15 million donation, St. John's will establish the Maurice R. Greenberg Leadership Initiative at the School of Risk Management, Insurance and Actuarial Science (SRM)—part of The Peter J. Tobin College of Business at St. John's. The Maurice R. Greenberg Leadership Initiative consists of several strategic funds that will expand academic programs, enhance teaching and learning activities and risk industry focused professional programs to attract the best and brightest students from around the globe to pursue academic studies and careers in the insurance industry. The Maurice R. Greenberg Scholarship Fund will provide full and partial scholarships to SRM students; The Starr Foundation SRM Faculty Support Endowment will support professional development, new resources and enrichment activities for faculty; and the Maurice R. Greenberg SRM Industry Leadership Endowment has been created to support new programs and resources for SRM activities. Fifty percent of the total endowment fund will be used for student scholarship awards; 33 percent will go towards faculty support; and 17 percent will be allocated for the leadership endowment. "We are incredibly fortunate to have the continued support of friends, alumni, faculty, staff and administrators of the University who make giving back to St. John's an important priority," said William L. Collins, Chief Executive Officer, Brencourt Capital Management and Chair, Board of Trustees at St. John's. "Through the grant-making work of The Starr Foundation, Mr. Greenberg has made an indelible mark on our institution. We are grateful for his benevolence, the excitement he has created throughout the University community and the example he has set for future donors to St. John's." "Over the years that I have been in the insurance industry, one of the important issues was to recruit intelligent people who were devoted to careers in the profession," said Maurice R. "Hank" Greenberg, Chairman and CEO, C.V. Starr & Co. Inc. and Chairman, The Starr Foundation. "Many of the candidates we saw were from the St. John's School of Risk Management. These candidates were more mature, focused and devoted to making a career in the insurance industry, and in most instances, making a significant contribution to that end." In addition, Mr. Greenberg remarked, "Many of the leaders in the companies we managed were very often graduates of St. John's and rose through the ranks to positions of importance. As many know, the company I am referring to is AIG, which operated throughout the world and required knowledgeable people and devoted internationalists, skilled in the profession of insurance whether it be underwriting, product development or leadership. I am pleased that our gift will help the University continue to attract great candidates for our industry, especially for our company." The Starr Foundation was established in 1955 by Cornelius Vander Starr, an insurance entrepreneur who founded C.V. Starr & Co. and other companies later combined by his successor, Hank Greenberg, into what became the American International Group (AIG), Inc. Mr. Starr, a pioneer of globalization, set up his first insurance venture in Shanghai in 1919. When Mr. Starr died in December 1968, he named Mr. Greenberg as his successor, both as head of the Starr Insurance Companies and of The Starr Foundation. Mr. Starr's estate of $15 million – most of it illiquid – was left to the Foundation. In 1969, Mr. Greenberg began the process of creating AIG out of some of the various Starr-owned companies. Mr. Starr knew what Hank wanted to accomplish with the Starr Insurance Companies, and asked that the Foundation hold its shares in what was to become AIG. By the end of 1978, Mr. Greenberg's decade-long process of restructuring was completed and the Starr estate exited probate with assets of $178 million. By any measure, Mr. Greenberg had already grown the Foundation's assets by an extraordinary amount. At the end of 2000 – some 22 years later – the Foundation was worth $6.3 billion, all of it attributable to the growth in AIG value. During one extraordinary period, AIG stock split five times in six years. Since 1955, The Starr Foundation has given away more than $3.3 billion, of which almost 2/3 went to organizations and programs in New York City and State. The Foundation still holds $1.5 billion, a testament to Mr. Greenberg's leadership, which created billions of dollars in charitable assets out of a $15 million bequest. The primary objective of The Maurice R. Greenberg Scholarship Fund is to create greater awareness and excitement around career opportunities in the insurance industry and expand SRM's total enrollment. SRM faculty will continue to engage in research and scholarly activities through the faculty support endowment. The leadership endowment portion of the gift will help SRM to further cultivate and expand its strong connections with the global risk management, insurance and actuarial science industries. "Mr. Greenberg is a pioneer, a visionary and a man who has continually set the standard for excellence in the complex and ever-evolving world of risk—be it in insurance, reinsurance or other allied financial and professional services," said Brandon W. Sweitzer, Dean of SRM. "With this gift, the School of Risk Management becomes immeasurably stronger and will build on its more than century-old mission of educating future business leaders, who themselves will endeavor to define this industry for generations to come." "I have known and worked with Hank Greenberg for over three decades," said Kevin H. Kelley, Vice Chairman of Liberty Mutual Group Global Risk Solutions, and Chair, SRM Board of Overseers. "All of us who have been lucky enough to work for him learned how to build businesses that created opportunity for countless employees and provided meaningful solutions for customers. Hank has always been a great leader, a teacher and a model for best practices in business." Founded in 1870, St. John's University is a Catholic and Vincentian university that prepares students for ethical leadership in today's global society. St. John's has four campuses—Queens, Staten Island, and Manhattan in New York, and Rome, Italy. The University also has three academic locations—Hauppauge, New York; Paris, France; and Limerick, Ireland. Students come to St. John's from 45 states and 116 countries. The University offers more than 100 associate, bachelor's, master's, and doctoral degree programs in the arts, business, education, law, pharmacy, and the natural and applied sciences. Students benefit from academic service-learning activities, extensive global studies opportunities, an alumni network of more than 184,000, and 17 NCAA, Division I men's and women's athletic teams. The School of Risk Management, Insurance and Actuarial Science was founded in 1901 as the Insurance Society of New York and over the years evolved into The College of Insurance (TCI). In June 2001, TCI merged with St. John's University, becoming a school inside The Peter J. Tobin College of Business. From its location at 101 Astor Place near Midtown South's business district and the rapidly emerging technology corridor, St. John's and the Tobin College of Business awards undergraduate, M.B.A., and M.S. degrees in the insurance, risk management and actuarial science disciplines. Through its Center for Executive Education, St. John's also provides education, training and consulting services to industry, governments, and regulators worldwide. For all media inquiries, please contact Jen Tucholski, Director of Media Relations at St. John's University, at [email protected] or 917-209-7164.